What’s the best way to start a Friday night in NYC? – freshly manicured nails with Zoya nail polish. The color I chose is Lolly. I can’t seem to steer away from pink shades because they truly complement my deliciously brown skin tone. I’ve recently began venturing out in polish shades as I have come across a lot of ladies that love darker shade lacquers. Nevertheless, I’ll rock a sick pink over all! 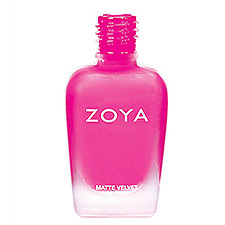 Fun and flirty, any girl who adores pink nail colors will love Zoya Lolly. It’s a bright and passionate shade that will make you want to use a lot of hand gestures to showcase this glam tint. A night on the town with a fresh manicure builds confidence. If you’re single in the City, watch men flock to you because of your well maintained style. It’s your world, you make the rules, and you can break them too!